BOOK USING THE ABOVE FORM. Looking for the cheapest Air Namibia flights and specials online? Instantly compare international flight prices and book online with FLY Airlines, or find out more about Namibian Airways here. Booking your own Air Nam tickets online is fast and easy with FlyAirlines. All you have to do is type in your departure airport, destination and preferred travel dates to get started. Powered by Travelstart South Africa, a leading Pan African flight booking company, our system trawls the worlds biggest airline and flight databases to bring you the very cheapest flights available on the internet. Then simply select the flight you want, complete your passenger information and pay online via the payment method of your choice. You can be booked and ready to fly within 2 minutes flat! But don’t merely take our word for it; discover what thousands of South African air travellers already know. Why not put our flight booking system to the test today yourself? Founded in 1946, Air Namibia (www.airnamibia.com) is the flag carrier airline of Namibia. Flying under the slogan “Carrying The Spirit Of Namibia”, the airline is a premium Namibian export brand. Headquartered in Windhoek, the airline operates regular scheduled passenger flights to 15 domestic, regional and international destinations. In addition, the airline also operates cargo services from its international flight hub in Windhoek International Airport and a secondary air hub at Windhoek Eros Airport. The airline is wholly owned by the Government, and employed over 690 full time staff members as of February 2017. The airline is a member of the African Airlines Association and IATA, and its frequent flyer programme is called Reward$. While the airline was nominated by Skytrax as the second best regional airline in Africa, the airline has been a cash-strapped, loss-making parastatal entity for a number of years running. The Namibian Government notified that airline that it would need to find its own resources to pay for lease agreements and other operational costs for the month of July 2017. As of July 2017, the airline has codeshare agreements in place with Ethiopian Airlines, Kenya Airways, Turkish Airlines and more recently with Condor Flugdienst. As of 1 August 2017, Air Namibia will be flying to Luanda, Gaborone, Frankfurt, Katima Mulilo, Luderitz, Oranjemund, Rundu, Walvis Bay, Windhoek, Cape Town, Durban, Johannesburg as well as Harare, Victoria Falls and Lusaka. The airline also received clearance to operate direct flightsto the United States in 2017. Previous destinations included Ondjiva, Maun, Munich, Grootfontein, Oshakati, Swakopmund, Tsumeb, Alexander Bay, Upington, London Gatwick and Livingstone in Zambia. The bulk of Air Namibia’s flight capacity is deployed along the Windhoek – Johannesburg and Windhoek – Cape Town routes. 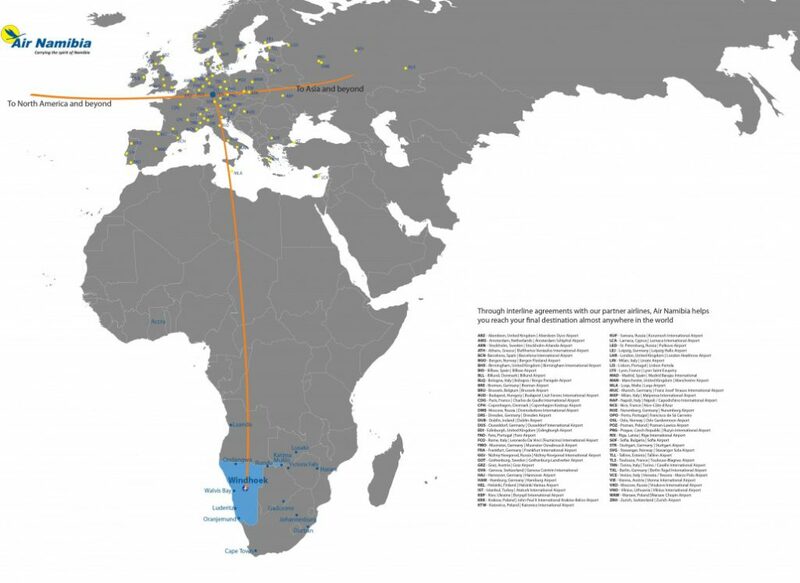 Future flight routes slated for inclusion in the airline’s flight network include Accra, Lagos and Nairobi, with Nigeria being considered a key growth market. As of August 2017, the airline’s fleet will consist of 4 Airubs A319-100s, 2 Airbus A330-200s and 4 Embraer ERK 135 ERs. To check in online for your next Air Namibia flight and save time standing on queues unnecessarily, click here. To track the position and progress of any Air Namibia international flight online, click here.